When I put on my bucket list to ‘watch a silent film’ I really just thought that i would find one of the more popular and available Hollywood style ones on DVD and watch it…but, sometimes opportunities come up when and where you least expect them and this was an opportunity to do things a little more authentically. 10 March 2013 marked the centenary of Australia’s capital city, Canberra. When looking at the 3 day program of festivities I noticed that the National Film and Sound Archive (NFSA) of Australia was having a ‘Silent Film Festival’. The films would be accompanied by live music (piano) and in some cases narration. This was how the films would have been shown when they were initially made. 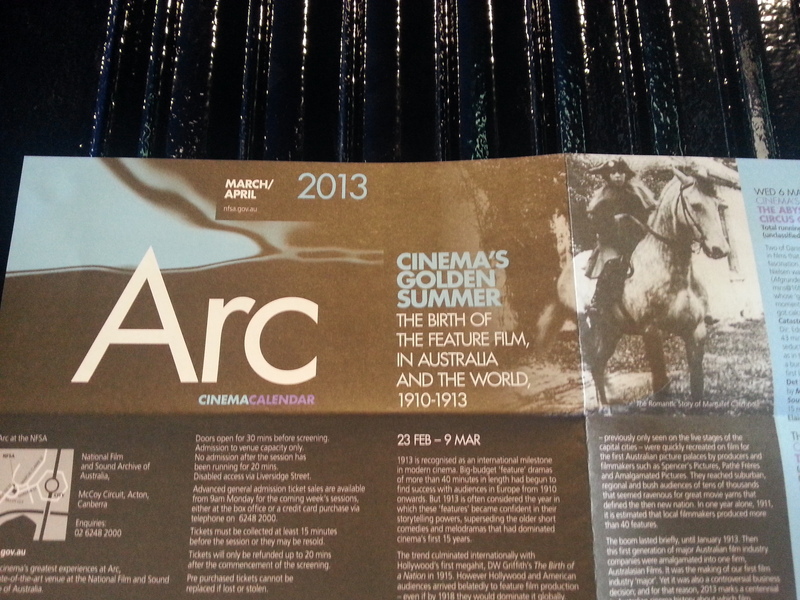 The birth of the feature film in Australia and the world, 1910 – 1913. When we arrived we were surprised to find out that ‘The True Story of the Kelly Gang” is actually the oldest feature film in the world! Running at 70 minutes and with a reel length of 1200m (4000ft) it was the longest and first feature-length narrative seen in the world. 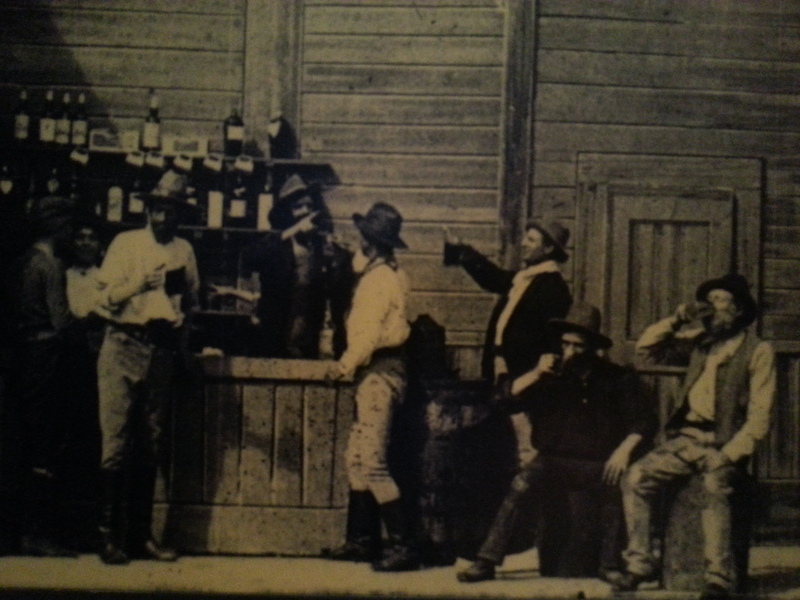 There were many short films made elsewhere in the world in the 1800’s but none that could be considered a Feature Film. Its release in 1906 beat the likes of Les Misérables in 1909 and Oliver twist in 1912. These feature-length films would soon become popular across the world and would be shown with short films either side of them on any given night at cinemas in the early 1900s. We saw the remaining 19 minutes of the 2006 restoration of the Kelly Gang film which is a combination of parts of the film found in a deceased collectors home in 1978, in a rubbish tip in 1980 and in the UK Film and television archive in 2000. There are parts that are hard to see anything at around the 10 minute mark as the they are clearly beyond repair. More information on this film can be found on the NFSA website. The piano accompaniment by Canberran pianist and composer Joshua McHugh was very well done and was the kind of music one thinks of when someone says ‘silent movie’. I noticed a few distinct patterns – buildup/suspense when a robbery was about to happen, dramatic chase music, romantic music and traveling/horse-riding music. Thunderbolt, was a bushranger film. It told the story of the real life adventures of Frederick Ward, his ‘cattle duffing’ crime, capture, escape from an island prison and his distress to find the woman he had left behind had died during his absence. The 2 most interesting parts of this film were the highly amusing dramatic distress poses at 1:52 when Ward leaves Jess and from 5:43 to 7:35 when Jess learns of Ward’s arrest and is “stricken insane“. Another interesting feature is that you can see the shadow of the camera man cranking the camera after the Ward’s swim across the channel at the 11 minute mark. A Miners Luck, was a story of a miner selling his mine to a prospector. The local drunk tosses the miner down the mine and steals his money only to have it stolen while he is passed out. The money is returned in the end. The romantic story of Margaret Catchpole, is a story of a love triangle but only the first part of the story is available as the second half is missing. Lastly was The Sick Stockrider. This story lends itself more to a poem with movie accompaniment. The verse in our reading was read at a lectern by a Canberra actor and was a narrative of a man on his deathbed, at a campsite, with his last remaining stockman mate, reminiscing about the times they had with their group of stockman buddies who had all now passed away. I couldn’t find any video of this film but the poem can be found on the Australian Poetry Library website. My experience of the whole event was a mixed one. It was great to witness the worlds oldest feature film and was interested to see the story of Ned Kelly and his gang as it is part of Australia’s history. I liked that I was able to experience the movies in a more authentic way and the live music was beautifully played. Thunderbolt and The Sick Stockrider were probably the most interesting however unfortunately the narration of the poem was poorly read and you spent much of the time correcting the flow and pauses in your head. This was quite distracting. The other 2 i found a bit boring to be honest. I wonder if this is because we are used to the fast paced, digitally enhanced, attention grabbing movies of the 21st century. We are bombarded with so much stimulus that unless a film is seamlessly cut together, action packed, thrillingly suspenseful, emotionally engaging or hilarious then we switch off (perhaps you have already switched off now!) Or perhaps it is just that the pace of the world was different then and this was reflected in the fledgling films of the times. I can’t honestly say that I am now a fan of silent films. I probably won’t go out of my way to see another silent film however I’d like to see the 2011 Hollywood film “The Artist” which is about a silent film star during the decline of silent films. Below are a list of sites i visited when gathering extra info about the films mentioned in this post. As I am more accustomed to writing about my own experiences of the world than actual events and histories please use the links below to get more accurate information on the films mentioned above as my writings are based on my interpretations of the films and may contain inaccuracy’s. Hi Cass! I was not real keen to see a silent movie but I did enjoy “The Artist”. Good on you! Glad you have done that one for me. Now I don’t have to worry!!!! I got to watch my fill of silent films every Saturday night at the Niles Essanay Theater in Northern California. It was a unique experience. They operate out of an original silent film theater. There is a museum there as well. People who haven’t seen them really don’t know what they are missing. They are truly a treasure and full of history and fashion. Good acting too – it seems odd but really, when you realize that you are understanding the storyline in complete silence – this is good acting. There was an accompanist at this theater as well. Piano recordings. it is als in San Francisco but I never got over there. I prefer the smaller intimate space. « “Singin’ in the rain” # 34 – Stand in the rain until I embrace the wet. Follow me in my journeys outside the everyday as I explore the endless possibilities of things to do that take me out of the daily routines of work and home. The bottomless bucket list and all adventures in between.